A tablecloth can change the atmosphere of any room and give it a homely flair in a few seconds. 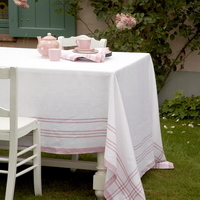 Depending on design and colour, the tablecloth can create a completely new feeling in the room. There should be a tablecloth on any perfectly-laid table. Anne's Table has tablecloths in many different materials, designs and single colours. You will also find matching napkins to most items. In many cases we can also offer the tablecloths shown in smaller or larger sizes or in special sizes and shapes (such as round or oval).